The aluminium bifolding door is now one of the most popular home improvement products. 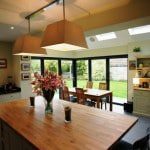 As more and more people choose to extend and improve their homes, it is likely a Bifolding Door will be at the top of their list. 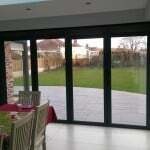 SGK Offer provide the finest aluminium systems in bifolding doors. Our wide range of products is regarded as some of the market leading aluminium sliding folding doors on the market. If you are looking for an expert bifolding door supplier, we have knowledge, installation and experience. 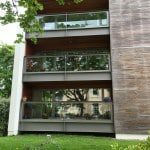 Discover the advantages of aluminium bifolding doors. Aluminium bifolding doors, also known as sliding folding doors are the latest and most exciting way to link the inside and outside of your home with slim, functional and beautiful sliding doors. If you are currently in the market for bifolding doors, aluminium is the preferred option. Not only are aluminium bifolding doors far slimmer than PVCu bifolds, they are also more reliable. The complex nature of how folding doors operate means reliability is key. Aluminium doors have proved their desirability and reliability over many years. You will find that professional window companies, builders and architects all regard aluminium as the best material for bifolding doors. Slim lines are also important in bifolding doors. With the varied British weather and your doors being closed for much of the year, you will want to look through as much glass as possible. This can be achieved with aluminium bifolding doors. Although PVCu bifolding doors are cheaper we do not believe they are your best option in the longer term. PVCu doors are prone to much more thermal expansion than aluminium such as south facing elevators or where doors are particularly exposed. Bifolding doors with many features as standard. Our range of bifolding doors are ultra secure, slim, strong and ultra reliable. Clever “finger safe gaskets” to protect hands subject to product and design. From a single window to a set of the latest bifolding doors, all are designed to help reduce heat loss and save you money. Our doors will become a fantastic feature of your home. Unlimited colour choices including wood grain colours and dual colours. Our range of doors is available in a huge choice of colours, designs and styles. 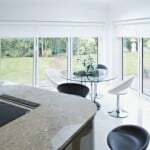 We can offer innovative corner bifolding doors that truly open up your living spaces. 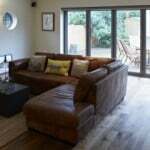 Our bifolding doors are suitable for houses or apartments. We have many years experience in the specialist field of bifolding doors. 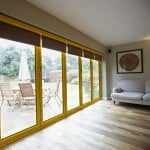 Contact us for a free no obligation quotation and find out how our range of bifolding doors can add real value to your home.